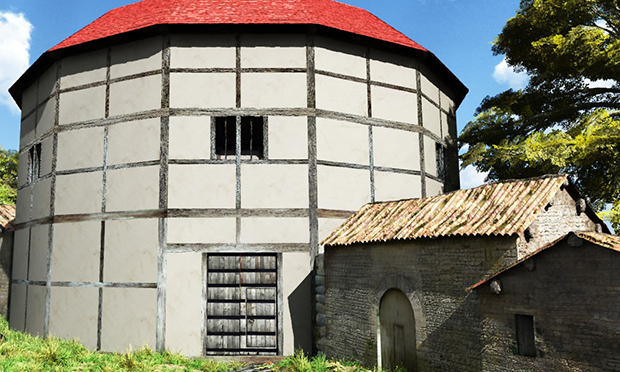 A new excavation at a Shakespearean playhouse in Shoreditch has revealed that it was turned into a sprawling complex for theatre goers by 16th-century actor and impresario James Burbage. The Theatre, not to be confused with the nearby Curtain play house, was built in 1576, and its remains were only found in 2008. It became Hackney’s 1st ever scheduled ancient monument – one of a number of sites of national importance that are included on a special list kept by the U.K government. A team from Museum of London Archeaology (MOLA), which has been investigating the site since it was uncovered, recently embarked on a new dig. A reconstructed view of The Theatre’s entrance. They have discovered evidence that famous theatre builder James Burbage was turning the site into a huge complex, where audiences could mingle and quaff during Shakespeare plays, which are known to have taken four hours or more. The team is now exploring small pockets of these outside areas, and it is hoped the research will reveal new insights and artefacts. MOLA has also revealed plans for an exhibition space, scheduled to open in 2019, which will allow the public to see the theatres remains in situ, along with other treasures found at the site. Lead archaeologist Heather Knight said: “It is incredible to be back on site at The Theatre. It is an internationally significant and iconic archaeological site and a really special place for archaeologists, historians, thespians and Londoners – but especially for Shoreditch, Londons first theatreland. 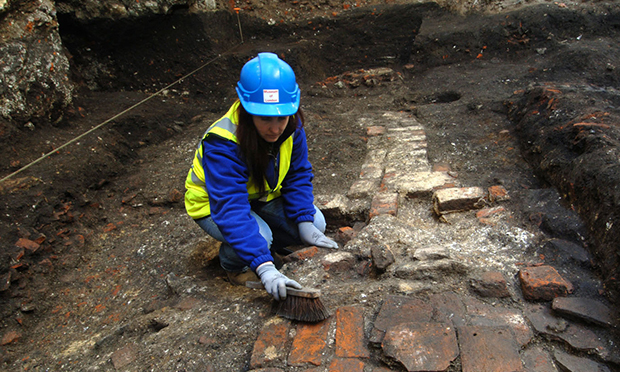 The remains of The Theatres inner walls were originally discovered in 2008. They form the classic polygonal playhouse structure surrounding the gravel yard where theatregoers would have gathered to watch performances. Several astonishing artifacts left behind by theatregoers, actors and proprietors have provided a tangible connection to the past. They include a complete Elizabethan goblet, a unique fragments of pottery depicting a well dressed, bearded man – the only one of its kind ever found – and pieces of the money pots used to collect entry fees. These finds, and the in-situ remains of the playhouse, will be on show at the upcoming exhibition space, alongside other 16th-century objects on loan from institutions across London. Leading charity The Belvedere Trust, which is behind the plans for the exhibition, hopes it will become a go to destination for dramatic events, and act as an important educational resource for the local community.